A chasm opens and swallows up a whole village in a blink of an eye. A crystal that can affect the world's fate, swallowed by darkness as its guardian, a young maiden looks on. A lass who set out on a journey to prove her worth to her father and a mysterious vagrant with memories lost. These events brought the four young heroes together and how the story revolved around them. 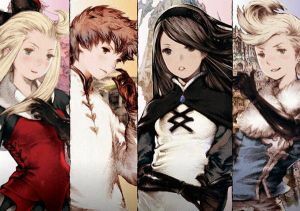 Bravely Default is regarded as the spiritual successor of Final Fantasy: The Four Heroes of Light. The game offers beautiful graphics, retro-style gameplay akin to the job and battle system of Final Fantasy V. Veteran players will feel the nostalgia and the genuine "JRPG" feel in this very promising title while new JRPG fans alike will surely enjoy the gripping story and engaging gameplay. This guide will cover the main story of the game, including the basics, job titles and many more. No discussions open for Bravely Default at the moment.